As of about now, my old company, Newnham Research, has a new name. Welcome, DisplayLink! Newnham is the part of Cambridge where the company started, but it’s one of those names which I only really intended to be temporary. That was three and a half years ago! Unfortunately, though, it proved somewhat non-intuitive for anybody outside the UK to pronounce or spell, so the change has been planned for some time. DisplayLink is a much better name for what they’re doing now, and it sounds like an industry standard, which is what they’re going to become. I like it. The London Tube map, created by Harry Beck in 1933, is considered a design classic and, for us Brits at least, is so iconic that maps representing reality look weird and distorted, and so are strangely fascinating. 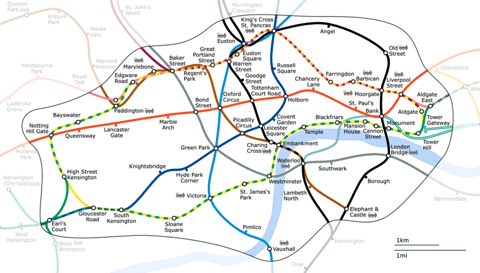 More maps on this Wikipedia page, and there’s even an interactive animation on the Transport for London site. Thanks to Tom Coates for the initial links for both this and the previous post.